It was one of those emails that made me chortle on the one hand, and on the other hand, it made…not chortle. Someone said Mary Corbett (sic) is not a real person but the articles are a collaboration of several writers. 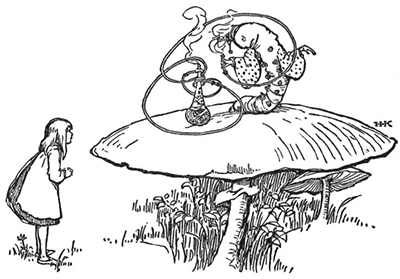 Admittedly, I felt a little bit like Alice in Wonderland, meeting the caterpillar. Whooooo are you? Needless to say, I was taken aback. I thought, Wow. All this work… I was initially somewhat deflated. Somewhat chagrined, even. But then I thought, It’s a legitimate question. After all, there are many blogs today that are collaborative blogs. In fact, most blogs that put out consistent content and a lot of it have several people working behind the scenes. If the person who made the statement doesn’t really read Needle ‘n Thread often, or doesn’t know me through correspondence, or has never met me, then it’s really very understandable. Besides, I don’t talk much about personal stuff here on Needle ‘n Thread – I’ll explain why, below. So, to set the record straight, today, I’m going to tell you a about me and about Needle ‘n Thread. Of course, if you’re only here for embroidery information and tutorials, feel free to take a break from Needle ‘n Thread, because… well… I’m about to bore you to tears! I come from a large, close-knit family, though somewhat spread around the US, and I’m fortunate to be able to say that we all like each other pretty well. I’m the youngest of seven girls, and we have a younger brother. Lucky guy! My dad is originally from Kansas. My mom is from Indiana, though her family moved to Florida when she was a toddler, and that’s where she and my dad met and married (after she got out of the toddler stage). So I have parents, like every person in the world does, and I have sisters and a brother, and they have kids and their kids have kids. I’m not married, and I don’t have kids. But I have an abundance of wonderful, adorably-darling nieces, nephews, great-nieces, and great-nephews. Now, by abundance, I exaggerate not. If you count all the people in my family from my parents down, there are… wait for it… one hundred and eleven of us. When we do stuff together as a family – whether it’s all of us or just a “small” portion – it’s always a Big Event. Now, one thing I’ve heard occasionally from readers (or from readers repeating things to me!) is that some people don’t like the fact that I never share anything personal on my website, so you don’t really get a chance to know me. I could tell you that I can’t eat a raw banana right out of the peel without gagging. But really, do you need to know that? Do you even want to know that? The reason I don’t share personal stuff on Needle ‘n Thread is pretty simple: this is an embroidery website, not a personal diary. People come here for information on embroidery, not information on my life. If there’s some kind of Big Life Event going on that would disrupt the normal flow of things on the website, I’ll usually mention it within a post. But it doesn’t happen often. You won’t find personal issues, rants, and the like on my website – people can get that kind of stuff anywhere in the world today. Just squizz about on Facebook for a while if you need a dose. My website is dedicated solely to embroidery. The rest – well, the world is full of it. It’s nice to have a break! I’ve been stitching since I was a kid. I learned from my older sisters and my aunt, who were avid cross stitchers during the early 80’s. I got into surface embroidery from there. After I graduated from high school (we lived in Florida at the time), I came out here to Kansas for college. When I was in my first years of college, I studied the history of art, and that took me into ecclesiastical embroidery, which took me into further experiments with goldwork and so forth. I taught high school English while finishing up post-graduate work and eventually became a college professor in an EDU program, teaching future teachers how to teach. I taught professionally for eighteen years. During those teacher-summers-off (ha ha ha – they aren’t really off – there’s a lot of work to do in the summer! ), I started hosting embroidery classes for children locally. The expense of hosting those classes (which were free) was a little hefty on a teacher’s salary while I was still paying off a massive student loan (ye gads). In stepped my brother, who is an IT guy, with the suggestion that I start blogging about embroidery, and maybe, through blogging, I might be able supplement the cost of giving summer classes. Blogging professionally was just becoming A Thing online. The idea of blogging – which I knew nothing about when I started – intrigued me. I saw blogging as an opportunity to extend the needlework classroom past summer vacation. Online video was just beginning to take off in popularity, and it seemed to me a great platform for teaching embroidery stitches. I used a free Blogger template, set up the blog on Blogger, got myself a point and shoot camera that could take video (a whole two megapixel digital camera! ), and started blogging. So that’s how Needle ‘n Thread started. I really didn’t have any idea where I was going with the website, and no inkling that it would become popular. But, lo! to my surprise, it did. And over the years, it grew. The old Needle ‘n Thread – remember? After several years on Blogger, I switched to WordPress and hired a professional design company (Imagemakers, Inc. out of Wamego, KS) to design the Needle ‘n Thread website you see now. Once that was up and running, Needle ‘n Thread grew like a weed in a wet, sunny climate. I couldn’t keep up with it anymore while teaching full time. But I had put a lot into Needle ‘n Thread, and we’d become quite a community here. I didn’t want to give that up. I had this idea that Needle ‘n Thread was important, at least in a small way, to a lot of people. And the notion of trying something different was appealing. An adventure, you know! So, once I had a livable buffer in my bank account and absolutely no debt, I decided to take the plunge and test it for one year. And one year has lead into almost four now. Needle ‘n Thread as a business has had its ups and downs on the “stability” side of things, mainly because of my slowness in developing anything that generates income. I’m still overcoming some big learning curves when it comes to technical obstacles, but I’m slowly getting there. I keep plugging away at it, anyway. My team? Well, my team is made up of lots and lots and lots of people! Me, plus some thousands of you, who are my best source of inspiration. But on my end, there’s just me. If you see an article on my website, it’s because I not only wrote it, but I put it there all by myself. If you have sent me an email and I’ve written back, that was really me! If you see stitchery, photos, ebooks, designs, videos – it’s because I stitched, wrote, edited, drew, compiled, photographed, videoed – and eventually, put it on Needle ‘n Thread. One disclaimer: when something urgent and major in a technical way goes wrong with the website – or I need to make a huge change – I hire the folks at Imagemakers to help me. They’re very good at that! There may come a time, business-wise, when it makes sense to hire someone else to help me out with the background stuff (the technical grunt work), but I can’t see that happening any time soon, due to financial constraints. If it ever does happen, you can bet I’ll be shouting it from the proverbial rooftops! I’ve said it before, but it doesn’t hurt to repeat it. If you like Needle ‘n Thread, if you use my website and learn from it or are inspired by it, and if you want to support it, then there are two ways to do that: by buying my e-books and by supporting my advertisers. Granted, the e-books are a little sparse right now. I’m currently taking a class in InDesign to help make production of printable work more efficient. This year, you’ll see some new offerings popping up, like the Stitch Sampler Alphabet. Eventually, you’ll also see online classes again. But there’s a lot of background work to do before I can approach them once more. I’ll keep you abreast of those developments. If you’re looking for fine needlework supplies, take a look at the advertisers here on Needle ‘n Thread! They’ve been specially selected and “vetted” – I’ve shopped with all of them myself, and they offer excellent goods and service. So now you know what Needle ‘n Thread is all about and that’s pretty much me in a nutshell. I love what I do, and I am really blessed to be able to do it. But I’m not a team of me’s. And you know what? I’m glad I’m not! Because then I wouldn’t have gotten to know so many of you! Thank you Mary. I know you love what you do — that is obvious in each post. I never worried about you sharing personal stuff. You have an “about me” section, and you are regulsrly telling us one thing or another about your life or family. It IS an embroidery site, not “Mary’s Life” site. I LOVE this blog. I miss it when I can’t read it every day. Thank you, thank you, thank you for this web site. Keep on doing just exactly what you have been doing! Amen. This is exactly how I feel too! Thanks, Mary, for a wonderful site. It has brightened my world! May I? Just to say Amen too. Thanks for all you do Dear Mary ~ we love you for who you are! This was a fun read. I love you blog and very often save them as well as send them along to my needlework friends. I taught needlework for several years to both adults and children and know first hand how challenging and rewarding it can be. Thank you so much for you daily blog, I have learned so very much and expanded my horizons. I guess I never doubted you were a “real’ person who was doing it mostly alone. Plus it was great to hear that I am not the only one who gags at even the thought of a raw banana. I know your site is about embroidery and I love it the way it is but it’s still nice to read a little bit about the person behind-the-scenes! Thank you for sharing all your talent. I can take quilting, crochet, knit and sewing classes locally but there are no surface embroidery classes(or ribbon embroidery) so I do appreciate you sharing your techniques. I also like to learn about the places we can buy GOOD QUALITY supplies. I bought a wooden hoop online and love it because the ones at the local franchise store was chintzy. I look forward to your compilation of alphabets. I loved the Lavendar & Honey eBook. We have been buried under 19″ of snow this week and after shoveling it was nice to sit and get caught up on your blog. For those of us who read your newsletter everyday, I can only say Thank You! Where you find time to stitch, blog and take photos, I know how time consuming the photos can be when one has to process them in Lightroom from a Raw file to a photo to use on a blog. Do you sleep much? Other sites have a army or a office full to manage a newsletter that happen once a week or month?. If ever ther was a super hero for stitching, you would be It!!! I appreciate you, Mary, for who you are and all that you have accomplished. Your blog has consistently been a source of inspiration and well as instruction, and through your efforts, I have been motivated to learn more about the art of hand embroidery. I sincerely thank you! You made the right choice. I love your blog for its information and the professional delivery of it. I admire you for keeping it professional. I’m a needlepointer mostly but I read the blog most days and I regularly use it as an instructional resource when I want to do some stitch. Thank you and keep up the good work. Mary, this is so wonderful! I’ve always been a little curious about you, haha! Thanks for sharing. Do you still teach those classes? What a wonderful thing to do. P.S. I can’t stand bananas either, I can smell if someone ate one right away and it makes me nauseous. Hear! Hear! Your blog is awesome. It gives the most and the best stitching help in the Internet universe. I could never have mastered the Plaited Braid Stitch without it. Mary, thank you so much. I can understand why folks would want to know who you are. Readers form a connection, like having coffee with a friend once a week. It’s disappointing to know that “friend” may not be real. But I could tell from your consistent voice in writing that you are the author. I appreciate the meme, but the reason I’M sitting here with a cup of coffee is that you have the best tutorials on embroidery! I live in an exciting city–NYC–my needlework however, centers me from all of the distraction. I can find entertainment anytime. Good embroidery? Not so much. Now if I could just embroider at some of these events; that would be exciting! Have a great day, and thanks for your column! Wow, just wow. Jumping into full time blogging (no matter how financially prepared) is brave. Thank you for sharing all of your knowledge and enthusiasm about embroidery. I’ve enjoyed your classes and look forward to when they are offered again. I’m also looking forward to Stitch Sample Alphabet. Thank you for creating and continuing Needle ‘N Thread. P.S. It’s good to limit how much personal information you post to the Interwebs for several reasons. Don’t feel like you have to share more than you are comfortable shouting on a street corner in New York. Thanks, Mary! I’ve been reading your site for several years (but after the redesign) and it’s so interesting to hear how the site as we know it now came about! Your summer embroidery camps sound so cool–what a great experience that must have been for all those kids. 🙂 Thanks for sharing! Dear Mary, all your fans are so glad you took that brave decision to go full time with your blog. We love it and we’re sure we would love you too if we knew you in person 🙂 Right, time to buy one of your e-books. I have been an avid reader of your blog for quite some time and look forward to your daily posts – I consider you to be my stitching idol, or should that be icon :)! Obviously these people that thought your blog was “collaborative” just couldn’t believe that one person could have all the talent displayed on this blog! Your posts are an amazing resource and incredibly inspiring – so much so that this year I have decided to come out of my comfort zone of counted threadwork and try different embroidery techniques. Thank you so much Mary for sharing your knowledge and experience on this blog, my stitching would have been the poorer for it had I not discovered it! Mary, I’ve always thought you were you!! I enjoyed reading your story. Thanks for sharing. And I love love your blog and website. It is my one and only go to for everything embroidery related! I ‘m with you….somewhat chargrIned that this question came up, I never for a moment thought you were anyone but you. Thank you for addressing it in a very professional manner. And thank you for a little bit of history of you and your family. Now on to stitching! I never doubted for a moment that you were real.Thank you, Mary, for all you do. It was nice to learn more about you as I’ve been reading your blog for quite some time now, and although I don’t always speak up and let you know I’m here, I am. Kind of like that silent student that sits in the back of the classroom. As a teacher, you probably wonder if I’m paying any attention. I am. I’m hanging on every word (and stitch) and learning with every post you make. Thank you so much for sharing your art and knowledge. Thank you for doing this – I like knowing a little more about your personal life, even though it’s none of my business and doesn’t impact the wonderful information you’re so generous with. It just rounds out the site and explains some things I’ve wondered about. Hi, Catherine! I’m glad it explained some things. If you ever have questions, I’m always game to answer them – you’re welcome to drop me a line! Everyday you share to my inbox, so I feel like you join me for coffee each morning. Thank you for helping me make my stitches play nice. Thank you, Tamra! I probably am drinking a cup of something on the other end of the computer when you’re reading the newsletter – so in spirit, there we are! Thanks, Jackie! Glad you enjoy it. And thanks for the comment about the photography….speaking of learning curves…! It is a pleasure to see the wedding picture of your parents! I love old family pictures. What a great family you are! And I read your blog every day! Thanks, Larissa! I’m so glad you like the picture! It’s one of my favorites! G’day there, umm…Mary, is it? The benefit of not sleeping? Reading a fresh Needle ‘n Thread post. The unbenefit of not sleeping? Reading a hilarious Needle n Thread post in the middle of the night. How the heck am I supposed to go back to sleep now? Did you know sticking your tongue out makes your ears glow. Check your photo. PS, You’ve got it all wrong. You’re supposed to stick the banana in your ear and chuck the skin over your shoulder for the next silly clown to skid on. Just ask any monkey that’s clowning around! Or is that any clown that’s monkeying…oh bother it Mary, GOOD NIGHT! Thanks, Kath! My mom saw that this morning (yes, my mommy reads my blog!) and she said, “Why did you use that photo? We’re EATING! You could have used another one!” I’ve always liked that photo. Dad’s got his tongue sticking out and mom looks like she’s about to burst out laughing. Sleep well, Kath! You deserve it, after that! I kind of guessed you were real. 🙂 There’s a picture and your personality comes through loud and clear in your writings. I confess: I have misspelled your name many times, adding that extra “T” but I’ve been more careful the past few months. I love that picture of you with the banana. I agree completely. The idea of biting into a slimy, super sweet banana makes my stomach roll. I can tolerate banana bread as long as it’s loaded with pecans. I wondered how we can support you and you explained. Sadly, I don’t shop online but I do share your posts, pin your ideas and like your goodies on Facebook. I’m sure there are people there that shop online. At least I hope so. Keep up your wonderful stitching and writing. You never cease to amaze me. Thanks, Irene! I definitely appreciate the sharing! Funny, this anti-banana thing that so many people have. I never knew…I thought I was alone in that! I have to admit, when I first saw the title of your post in my inbox, I thought you were hacked. I realize it must be hard for one person to put all of the resources you offer together, but I’m glad it’s just you. It makes the tone of your blog consistently excellent. Thanks you for all of the wonderful tutorials and for choosing your sponsors so carefully. I have found the items I have ordered from them to be of excellent quality. Mary anyone who reads your blog regularly will simply know that its you and only you who writes on needle’n’thread! Your style is unmistakable and it is the same over the years!Yes you are lucky to be able to do what you love to do but you took the risk and worked for your love! You are inspiring! I don’t like bananas either. Wow! I didn’t know there were so many of us out there! 2. You have the power of bilocation. 3. You are the successful product of a secret government clone project. Heh heh heh…. None of the above, I’m afraid. And not sleep? Gosh. I love sleeping. I get 7 hours in every night! 🙂 I wouldn’t mind being an octopus, though. several more pairs of arms that could work independent of the others wouldn’t be a bad thing – until I had to leave the house! Mary anyone who reads your blog regularly will simply know that its you and only you who writes on needle’n’thread! Your style is unmistakable and it is the same over the years! Yes you are lucky to be able to do what you love to do but you took the risk and worked for your love! You are inspiring! You are quite right about writing style – it’s like a little ID kit and one of the reasons we know that your blog is your blog. Will be commenting further today – I’m sure other comments will be inviting a response. You dislike bananas, good, I think I would dislike your blog if I thought you sat writing it while gobbling bananas like a starving monkey. (snicker) I also dislike bananas, their taste and texture is like a stick of baby food and I do not need that. For the record, one of the nicest things about your blog is that very little of it is about your life. Blogs become uncomfortable (my opinion) when the authors frequently complain about their upstairs neighbors noisy party, or the little brats up the street tearing up the lawn on their bikes or how their friends husband left her for his martial-arts instructor. I expect embroidery blogs to talk about floss, needles and organization etc, not about toenail-fungus, make-up tips and personal life-difficulties. If your blog was a bullying or bone-cancer blog I would expect the discussion to get more uncomfortable, but not a blog that is about my hobby, which is what I do to briefly escape all of that. Personally, I am glad that the worst things that appear on your blog are busted needles, snafu-ed stitches and dye-lot difficulties. Just my thoughts, no negativity intended. LOL! You are funny, LA! You forgot to tell them I’m short. 🙂 Which reminds me…must reply to that email! Thanks so much for this information. I have been always in awe of all the information you put out there for us to enjoy. I did not realize you were doing it all alone. This make the information even more precious. Please continue the good work…and on with the classes, i would love to attend. PS i am ready for the stitch sample alphabet. thanks for being here and sharing and teaching your skills. Thanks for the information on Who you Are. I am at the retreat where the original question came from. We are all devoted readers and glad to know you are a “real” person. Great job! Mary, it would not have occurred to me that you might be several. You have an authentic voice and provide a most valuable service to all of us stitchers out here in PC land or Apple land. I am coming back to stitching after years of working in insurance and use your column extensively. Thank you. Oh, Mary! People never cease to amaze me! Never in my wildest imagination did it even occur to me that ‘you’ were not ‘you’! I have been following your website for many years now and have always referred to your stitch videos when needing instruction for a particular stitch. I’ve even gotten answers to questions that were previously answered in your search which is tremendous. Please keep up the good work in what you do and love, as I love it too! Please know that you are appreciated by many. I could have lived with you being a team. However, you not like bananas is a bit of a bummer :). Keep up the good work and I wish you a healthy income as well. I know, Jessica – the banana thing. Sorry! I really enjoyed reading a little more about you! And wow, I am impressed and more than a little envious that you were able to give up your teaching job for one you really love. I hope I can do that one day. And the reader probably thought you were a whole crew of people because you know so much about embroidery! Your talents, skills, and knowledge are really quite awe inspiring. :o) I look forward to your daily blog posts, and read all of them. I love following your projects, and I enjoy the free patterns you provide to us. Thank you, Lisa! I hope you can do it someday, too, if it’s what you really want to do! The disclaimer: you have to be prepared for ups and downs! It’s definitely a full-time plus job, and the returns are not always guaranteed. At one point in my teaching career, I was teaching five classes a day (and all the prep work, etc. that goes into that), plus an afternoon “seminar” three times a week. Even compared to that year, which was rather harrowing, I work more now than I did then. So, know what you’re getting into before you take the leap! At the same time, like I said, I love doing it. It’s worth it! A real normal person ? I thought you were a sort of Shiva, with ten hands and some spare brain in a drawer to be able to manage so many things at the same time ! THANK YOU for your kindness and all what you teach us ! I love your blog just the way it is! Yes, it is an embroidery blog and that is why I stick with it. If I wanted to know what some embroiderer had for breakfast I’m sure there are other bloggers I could follow. You are perfectly justified to keep your private life private! But I also love that it isn’t sterile textbook information. You add some personality and charm to each of your entries. It was fun to hear about your large family! Wow! My parents had 9 children, but we don’t have anywhere close to 111 at our Christmas dinner! My parents only have 11 grandchildren and 7 gt-grandchildren (so far), primarily because my 4 brothers never got around to marrying and procreating. Hi Mary, Thanks for sharing, it’s nice to know a bit more about you, because it’s like getting to know a bit more about a friend, which you are to many of us. None of my personal friends has the interest, knowledge and/or passion for embroidery that you do, and so I am very glad to know you. Indesign (and some of the others) have been super helpful to me, and no doubt they will up your game too. Keep up the great stitching! I love the focus on it, as well as the history, technique and enthusiasm you bring to us. Thanks, Lynn! Oh my gosh, I am totally in love with InDesign! It is (to say the least) powerful! Working through the course has been an eye opener. I’ve used Adobe’s products for years, but primarily just Photoshop and Illustrator. But wow, I’m so glad I’m learning InDesign. It’s definitely worth taking the time to learn to use it well. I feel a huge bout of Efficiency coming on! of course you are you! Your writing style is unique and easily recognizable, the detailed ( but not boring) explanation obviously come form somebody who knows how to make it interesting and instructive. As soon as I find time in the morning, in between work, I sit down and read your daily blog – just as breather, a place where nice things happen even when colors are wrong or stitches go awry! Your video stitching demonstrations are great – I usually have them run on my tablet in front of me and try them on scraps of linen or even Aida fabric! I hope I speak for a lot of your readers, keep the good work, continue teaching us and also entertaining us with your quirky comments and wonderful sense of humor! I can’t tell you how many blogs to which I have subscribed and then unsubscribed because they got too personal. Authors of books I like tend to be especially prone to this. I have always appreciated how professional you keep this blog and sprinkle just enough personal tidbits to keep things warm and interesting. Needle ‘N Thread is outstanding. I don’t comment very often, but I do read and enjoy on a regular basis. I love the very professional approach used – and I feel the “personal tidbits” arise naturally out of the topic – one of the many reasons I like following this site. It never crossed my mind that there was more than one person writing this-I did wonder how you found the time. Thanks for all the time and effort you put in here, and even though I’m not primarily an embroiderer (I spin, weave, sew, etc., etc.) I will do my best to support your advertisers and keep you in business. Thanks, Linda! Yep, it’s because I approach it like a full-time job. And, living in a little house, I have very little upkeep! Hi Mary, I had to take leave of my needlework for several months and happy to say I back with needle in hand now! Thx for sharing your story with us. It’s always nice to know a little something about people you admire. Your dedication to your newsletter and creating such a wonderful educational tool for us embroiders is so appreciated. Thanks so much, Lynn! So glad you enjoy the newsletter! It wouldn’t matter to me who you are — I love this column! I have learned so much and found many new suppliers, including Inspirations magazine and Hedgehog Needlworks. The information on patterns and gold work has empowered me to order the Marian pattern, which I will do as soon as I go to the computer where I can download and print. A wonderful, wonderful job, Mary. Ah! I knew I liked you! I love your wit and humor, you are so talented and you work hard. Loved reading this post and getting to know a little about you, I didn’t know we had so much in common. I also come from a family of 7 girls and 1 boy! (I’m number 5 and he’s number 6.) There are not so many of us at family things due to only two of my sisters being married and only 1 of them has kids, but we’re pushing 20! I never doubted that you were not a real person, to be honest I would have been very disappointed if you were not you! Ah, life growing up in a big family! It’s grand, isn’t it? I wouldn’t trade it! Although, my younger brother (and he’s not young, mind you – he’s 41 this year!) still pulls my hair. Rrrrrrgh. Thanks for sharing! You’re a HOOT and I’ll bet you’re pretty fun and a good friend too. I was shocked to think that anyone would think that you aren’t a real person. I spent years teaching writing and can recognize different voices in writing. You say so much between the lines when you write about embroidery. We know you are passionate about embroidery and teaching us to try stitches we may have thought were much too difficult. I remember looking at crewel work years ago, thinking that I had no idea how to do the beautiful stitches so I stuck to cross stitch. You have encouraged me to try new stitches and to embellish my other sewing projects like quilts and clothing. I’m now finishing a quilt that has hearts that embellished with the stitches you featured when you were giving us a new stitch every day. On a quilt forum we discuss Mary’s suggestions as if your column is part of our group. Cheer up! We knew you were a real person and look forward to your posting every day. I’m sure all of us who hate bananas will be leaving comments, since we are such a rarity! Have to say I chuckled at the wedding picture, because I have that exact same expression as your mom’s in my wedding-cake shot. Even though I can’t call myself an embroiderer, I love textiles and very much admire your site. Your enthusiasm, expertise, & clear instructions are exemplary, and your photos just keep getting better and better. Thank you, your majesty! Yes, I’m utterly surprised there are so many people in the world who don’t like bananas. I thought it was just a weird quirk. I’ve tried to like them, but ……! No. Ew. Can’t even think about it too hard…. Love,love,love your blog! My daughter teaches, we are a teacher family. Hats off to you. Thanks, Beth! Wow! 62 years is wonderful! Congratulations to them! I found this blog about 3 years ago and I often wondered how things began. Thanks for sharing your story today (and the wonderful wedding photo of your folks!). I enjoy two features of your blog. First, and primarily, your easy to follow directions/videos/wordings plus how you describe your reasonings as to “why” you do things. Sometimes I learn more from the “why” you changed color or stitch or idea than I do from just copying the original pattern. And, today’s message tells me that you were a teacher…and a teacher who taught teachers…so that is why you are so “clear” about things! And, second, the folks who post messages at the end of your daily blog. Not only do I imagine that I know some of them because they post frequently…but I am constantly thrilled to find folks from outside the US and Canada…like all over Europe, Australia, New Zealand, the Philippines, India, etc. I no longer feel that I am isolated in my enjoyment of embroidery…but I have so many others from all over the world who share their ideas…it is fantastic! Thanks, Mary, for today’s message on who you are and what this blog is all about. I sincerely hope you continue to share your ideas with us…well…forever! Thank you, Bonnie! Your second point is what I especially love about Needle ‘n Thread! It really is nice to have this whole “community” of interested embroiderers from around the world participating in the blog. I love reading comments!!! I remember Mary from way back when her blog was very … very new. She contacted me (then a needlework store owner) for … gosh, I can’t remember what. Back then I was intrigued by her vision, now I’m amazed at her talents and achievements. Oh, Joey, you will LOVE InDesign. It is definitely worth learning! It makes layout and editing so easy, once you get the knack of it. Lynda.com has some very good introductory and advanced video tutorials on it, too, if you’re serious about learning it. And if you go with Adobe Cloud, you can share documents back and forth….in case you’re translating or editing or anything for anyone! Twining Thread – oh do I ever remember! I loved that shop. And I still have many little things from it. In fact, I was playing with some wired ombre ribbon just the other day, that came from you. And you introduced me to Gilt Sylke Twist, remember? Dear Mary, What a delight it was to read today’s offering. I remember stumbling by chance on your website and I liked it. I was just learning how to operate a computer and to surf on the internet. It was on 24 July 2009 and I got the following when I joined you news letter. You are successfully subscribed to Needle ‘n Thread. Thanks for joining me on my needlework adventures! In the meantime, you can return to Needle ‘n Thread to continue browsing. You surely have kept your promise. It is always such a highlight to get your daily letter. You have taught me so much and I must thank you for that. When I had a question you always answered. I am still in awe how you manage your time. You also have this wonderful ability to explain the most complicated things in a way to make it easy to grasp. Keep up the good work. Lots of love from one of your biggest fans. Thank you, Elza! And over the years, I’ve enjoyed your embroidery, too – thanks to Facebook! Oh, and your turtle and strawberry! Oh… and the Package That Never Arrived. Rrrrrrgh! Remember? Funny how that just came back to me. See, we even have “remember when” memories! Dear Mary,thanks for the beautiful reply. Yes of course I remember the package that never arrive, but that is not important. My little turtle and strawberry is still one of my favourite pieces. Just to show you the power of Facebook, one of my many Facebook friends told me she knows the photographer who took the original photo. The photographer’s name is Haley Luna and she is also an American. She loved my embroidery piece and was really pleased to see my interpretation and suffice to say we are friends on Facebook too. The most important part for me , I could give her the necessary recognition. I look forward to receiving your blog every day and it never occured to me that there might be several Marys (is this the plural? 😉 your style is witty and consistent. But most of all, this is just the best and modt resourceful blog on embroidery, ever! You helped me rediscover my childhood hobby in a very difficult personal time and I will be always grateful for it! Oh, that’s exciting, Kate! You’ll have to let me know how the class goes!! I hope you love it! Good luck with it! Mary, thank you!! The internet is an impersonal and remote medium. It is important–for me, at least–to “see” the human being at the other end of any blog I read every day. In fact, if I don’t get that human touch from a blog, I often lose interest and drop off. I think it’s actually essential for a blog to be somewhat personal. After all, we could all just go read a book about embroidery, right? But we come to you *because* you’re a real, live person! 🙂 While I never thought you were a dummy persona created to represent multiple contributors, I am happy to know a bit more about you. It completes the picture of this person who visits via my inbox every day, and who is a constant inspiration to me. It makes me even more deeply invested (is that possible?) in your splendid blog. Thank you for sharing today’s post with us. I look forward to everything you have planned for the future! Thanks, Susie! I’m glad the videos come in handy. I really want to make more of them this year……..
Mary, you’ve blessed me and countless others over the years; bless you for having the courage to take the plunge and do this full time! I don’t know how you do it all, but am so thankful you do. BTW, where in FL did your family live (being a FL gal myself)? Wish my family were even half the size of yours! I have an email queued for you that I have yet to finish. Soon, soon! Hope you’re doing well! I’ve really enjoyed your video tutorials, ebooks and blogs – you have taught me SO MUCH over the last couple of years and I am so grateful for you. While you had mentioned a while back that you were a teacher, it was so fascinating to hear that you were a teacher of teachers. 🙂 I am a teacher too – elementary and now homeschooling my son – so I can really appreciate your gift of helping others. It is really interesting to hear your story and hear how brave you were to let go of one passion to follow your dreams. I love that and again, I am so grateful for all that you’ve taught me and you’ve opened up whole worlds I didn’t know existed! Thank you!! Read you everyday. Love learning from you and the comments. Don’t need the personal stuff -except when you have the winter cold, which I can sympathize with. Ideas for ebooks- challenging projects- simple stuff is abundant on the web. Stay well, happy, and creative. Oh Mary! I love your post today. I’m a little mystified that you could ever be cloned into five more Mary’s to make a N&T team, but on the other hand it’s perfectly understandable that many would think it’s not humanly possible to put out the sheer quantity of work that you put out there on a daily basis. I remember reading The Hare With the Amber Eyes, which was the first time I’d heard of the concept of a National Treasure – well, I think you are one of our National Treasures and I’m so deeply grateful for stumbling upon your blog years ago, getting to take a class from you here online, and learning from your excellent, excellent written, photographed, and video instructions. You are on my short list of the people who have transformed my creative life. Your teaching has mentored even from afar. When GOD created the world, he knew that we needed a…GOOD,KIND,GENEROUS,UNSELFISH EMBROIDERY TEACHER, therefore he created Mary Corbet. Because of this…we are a million and one happy followers. There are many of us who look forward to you brightening our mornings (for us Aussies). We are mermerised by your beautiful work and projects and will start more than one, which we clearly know we do not have the skills for…wonder who that might be…hoping that we will achieve it with your guidance. GOD BLESS MARY, so happy I discovered your website. Thanks so much for the intro+. I love all the wonderful content you provide! And, now I feel a little bit like I know you too. That’s good! There’s only one Mary. However, I can understand why someone would wonder if Mary was truly a conglomerate of stitching experts. Mary, and all the wonderful things that she shares with us, is AMAZING. Once upon a time I believe you made the statement that you don’t watch TV? Your talent, skill and commitment are as inspirational as your embroidery. ps – I really like your advertisers and utilize the links on NeedlenThread. That’s true, Katrina. I don’t. I haven’t since I was about 20… Glad you appreciate the advertisers! Dear mary and readers, embroiderers,…. Thank you for this post Mary – it was wonderful to meet you on a more personal level. Having said that, I completely understand the need to keep the blog separate from your personal life. I think one of the beauties of this blog/site is the professionalism (along with all the great information you share with us). You have become so well known in the needlework community now and there are so many demands on your time and so I’m sure you want (and need) the separation between business (which is really what this is now) and private. I’m sure most of us have no idea of the amount of time and effort that goes into keeping up with something of this magnitude and kudos to you Mary for all you do. Hi Mary, it would never have crossed my mind that you could be multiple people! I read your blog every day for the inspiration and knowledge that you share. It can be a bit lonely when no one else nearby is interested in embroidery, and it makes me feel part of your community when I read your blog. Of course it is interesting to know a bit more about you, but that is not what I look for when visiting your site. Thank you for all your hard work! Mary — I’m so happy to meet you. My first love is quilting and sewing. Last night in my nightly 4AM wake up thanks to menopause, I designed a sewn carrier/organizer for my renewed passion of embroidery. I finally fell asleep when I came up with elasticizing the mesh pockets to hold the accoutrements and supplies. I kept going back to zippers in my head, which I thought would be so much more trouble. It will also fold over. I can see why people would wonder about you just being you…. because of the many sewing and quilting blogs I read, it seems only yours has daily posts, if they are run by a person. It’s just an awful lot to keep up with. The few I read that are daily are all multi-contributors. And a few of my favorites I had to drop because, well… they stopped posting. Life happens. But I am very glad you’re here, doing what you do. I thank you for it. Hi Mary! I feel as I know you for a very long time! You are responsible for my actual love for embroidery and for many books I bought about. I found your blog few time I started my own blog (on Blogger too) I think I wrote my first comment in your blog (I always choose carefully where i comment even today) I have to feel good reading a blog and you have been making me to feel so good for all these years and so free to ask all the silly beginner questions.! I just love your blog as it is, I love your writing as it is. Simple but so professional in each detail and I only sorry future teachers have lot such precious teacher for their future. We readers gain an exceptional embroidery teacher.You are a gem, i’ve written this more than once and once again i have to thank you from my deep heart all the beauty you teached and showed to me. And all the help you are always willing to give. A BIG BIG Thank you! Nice to know a little about you! And I am totally excited to see that you’re an academic. I’m finishing my PhD in Russian literature in the next couple months, so it’s nice to see another academic background out here in the wider world. I always knew the Needle ‘n Thread team was…you. I could understand how someone might think you were several people though! And the English teaching explains so much on your writing and the clarity of instructions. But somehow what I did miss, is that you have been doing needlework full time, no more teaching school. I’m glad I didn’t know (or forgot?). I have stopped reading some blogs because the blogger decided to go “professional blogger” and all of a sudden it became all about selling, promoting, linking to products they get for free to “review”, etc. So thank you for continuing to keep the blog about spreading the needlework love and know-how and not going all commercial. Bananas – there’s about a 1 day time frame when they are OK, but I hate ’em even slightly green or over-ripe. And WHY do food companies put them in so many strawberry items?!?!? What’s wrong with plain strawberry???? I remember the old logo and have communicated with you several times about little things. Thanks Mary for being you. Oh my goodness, you not real. That one is hard to believe as your unique personality shines through on each and every post. I’ve been with you since I think you started with WordPress or pretty soon after. Every day is a blessing. As I hail from Kansas I always enjoy hearing you talk of the weather when you infrequently do as I am still homesick after 35 years. Do I want to know what you had for breakfast? No. I appreciate the fact that when I come here I am going to be getting what I am coming for… Embroidery Knowledge. I don’t have a lot of time to spend at the computer daily. I am not subscribed to many blogs. I know when I click on to your site I am going to find useful information served up with what I find wonderful dry wit, and I always leave with a smile. I have always known that you were a REAL person. I appreciate what you do. I think it took real courage to give up your “Real” job and pioneer out into this new arena. I thought so when you did it. In fact it rather amazed me. I’ve come to think you can do just about anything, as you can do any kind of embroidery you put your two hands to. You have taught me so much and I am inspired to work on my projects! Thank you! I love your blog, your embroidery is really beautiful! Thank you again for what you do! Oh Mrs. Corbet, if you only knew how much I care about and appreciate you! Don’t you ever feel deflated and chagrined – we all love you! I know I feel like I really do know you; like we’re friends and we hang out every week and make each other smile. Something about your words. . .you’ve really got a way with them 🙂 Through all of your adventures and misadventures I feel as though I’m right beside you, laughing and learning all along the way. You are the teacher who is also the friend. Ever since I first found Needle & Thread, I have felt welcomed here. I look forward to reading your articles each morning – they always brighten up my day. It is so wonderful if you are wondering how to do something to be able to just come and look it up on Needle & Thread and always find what you need! But remember this: You are a part of our Needle & Thread family as well as your own – and we love you just like a sister! Postscript: I’m glad you hate bananas. I can’t stand even to smell them, let alone Eat one! Seriously; how does one go about eating something as awful as bananas? Post Postscript: You are going to keep sharing stuff with us on Needle & Thread forever, right? Like, forever and ever and ever, etc.? By the way. . .did I mention that you look almost exactly like your mother in that picture? . . .the wedding picture compared to the Who is Mary Corbet? picture, I mean. Not compared to the I Hate Bananas one! GREAT post, Mary! It’s nice to know a little bit about you, but you really do come through each post you write in your unique style. I used to buy bananas because they look so “healthy” sitting on a bowl of other fruits, but they would invariable go brown and icky and end up getting composted (or tossed). Finally, I realised that I really just don’t like the things that much. Made into a smoothie ok, but otherwise, bleh. Fun photos! Never doubted that you are a real person and admire that you were able to step out and follow your passion. I love all the embroidery information and inspiration you make available daily. Maybe it’s my business background but I have wondered about how you can make a living at this and how you can get all that wonderful stitching done while preparing your daily blog and monitoring and responding to comments. Aside from the revenue from your advertisers (who all seem like wonderful needlework businesses) are there other sources of revenue from the blogging? How anyone could contemplate your not being one person is beyond me. Your personality shines loud and clear in every post–generous, compassionate, optimistic, well-rounded in knowledge (what a Liberal Arts education used to give us in the old days), talented, a grand teacher (knowledge many can have, but clear, thorough instruction is a Gift), a great sense of humor, someone who is always ready to learn something knew (whether fact or skill), and I could go on and on. Thank you for your blog. It is the ONLY one I read daily through your e-mails. I shop around for this or that, but your instructive and fascinating posts I share with young and old, friends and family. You are NEVER boring. Today I learned that you are also very brave, leaping into the unknown to pursue something you love and wish to share. I loved your post about yourself. As someone wrote earlier, a very professional way of approaching the subject of self. Your parents’ photo reminded me of my own parents, and how I love to look at the old pictures. Thank you for all that. Had you not done it, though, I would still love all you write and teach. One thing though, I wish you could teach me how you do it all! The Lord bless you, Mary Corbet. You have such great intuition about how to keep us all “engaged” — not too personal, not too “impersonal”, education on ALL levels, long term stuff, short term stuff, resources, ideas, inspiration, funny stuff, and mostly all REAL stuff — just like YOU!! (well, not really……..!) You have managed to keep and grow quite a wonderful community of stitchers worldwide and I cannot tell you how MUCH I get from it on a daily basis. It is part of each-and-every day. You are one very special gal and I think all of us stitchers are SO grateful! Thank you and keep at it! Hi Mary. I just wanted to echo everyone else’s sentiments. I’ve never met you, and I rarely comment on your awesome articles. But I am absolutely in love with your website. I have wondered however, many times, why you don’t have your own books or notes or collections online for us to purchase. Yes, I know I could print them out, try to categorize them and make booklets. But how much more convenient would it be for you to have series that I might purchase. With the beautiful pictures that you already have and possibly with dvd’s. I would absolutely love love to have my shelves filled with your products. You’ve already written enough to create many booklet series. Just categorize them, (one about basic embroidery stitches with photos, one about threads you use with photos, etc. print them up, spiral bind them and ship them out. In the beginning they wouldn’t have to have a fancy cover, printed and distributed by a fancy publisher. And yes, very quickly, you would have to hire an assistant or two to help you. But, your hundreds of fans and your bank account would love you for it. I like bananas, especially sliced into a big ol’ bowl of Cheerios. But I will not hold your banana-phobia against you because I’ve discovered and learned so much from you. Honestly, your site is one of the most user-friendly “teaching” blogs out there. And two of your advertisers have become my most trusted sources for embroidery gear. Just keep doing what you’re doing, Mary; it is obviously working! I love your blog just the way it is. One of the things I love about it is that it does NOT document every up and down in your life. We all have those and I don’t need to read about anyone else’s problems to feel better about my own! I love learning from you and reading about your adventures in stitching. Thank you for all you do! I recognized every word of your biography. Yes, I’m a retired teacher…..31yrs. in fourth grade. My plan was to become a very competent needle worker. One morning I Googled “Embroidery Lessons”, found your blog and have been as happy as a clam! We say that a lot in Boston! I close with a smile and a deep appreciation of your career choices. Thank you for sharing. And thank you so much for this blog. I continue to find inspirations and have directed several folks to it who were just getting started. A great resource, Thanks :)! Thank you so much to have enlarged my own basic practice out of “les petits croix” et “Le point de tige ” …. She uses an alias to protect her privacy. I’m glad you chose to create this website which focuses on your needlework journey, desire to teach and disseminate embroidery information. I enjoy the forum you have created. I think folks often look at various personalities from history and wonder how on earth they managed to produce such quantities of work; you are living proof that with focus and good use of talent, and probably not wasting a whole bunch of time on unimportant things, much can be accomplished! Bravo Mary! Your blog is wonderful & unique. You’re a blessing. Thanks for a lovely piece about you. I read your site for the sheer joy of it, and occasionally I pick up a piece of embroidery because you inspired me. Unfortunately, I’m not an avid embroiderer, just an avid fan of beautiful work … and your work is certainly that! Thank you for sharing YOU. Mary, I never ever thought you were not, simply, Mary Corbet and the one person in charge of this website, the only person writing the newsletter, the person writing responses, the artist creating all those wonderful designs and helping us with the process, writing the book reviews, explaining how to do certain stitches. I’m not a blogger. Oops. Never thought I was. I stumbled into your website a few years ago (not sure of the year) when I was trying to figure out how to do a certain stitch. I tried signing up for your newsletter way back when, but something didn’t work on our system. No problem. I visit your site every day. I’m hooked. I’ve learned so much. Better still, when I was tiring of needlework, you sparked my interest again. I’m at home here most of the time due to some health issues. Needlework is my outlet. When I lost interest, I felt in a panic. But due to your newsletter and the wealth of information available, it’s back again. I’m having a great time. I go to bed thinking about it, and I wake up running to your website and then stitching whenever I can throughout the day. You do so many things that I’ve wondered how you could possibly manage it all. And I’ve wondered about your family life, so I thank you for sharing, though it certainly wasn’t necessary. I wondered how you supported yourself, and now I know. I’ve ordered from several of those sites and others that I’ve learned about through your daily missives. All I can say is THANK YOU. That, and I like bananas, but don’t feel that everyone should! Wow. You share with us an ABUNDANCE of excellent, excellent information – for FREE! – and people have the gall to say they don’t like that you don’t share personal information on the interwebs? RUDE AS HELL. Wow. Mary, I for one appreciate all the info you do generously share. As someone who puts ZERO personal information online, I say too bad for those who don’t like it. And wow, I had no idea that you were no longer teaching full time! Gutsy, and I’m very pleased for you that it has worked out, despite the ups and downs of not having a steady income. I wish you continued success, you seem like a lovely lady. I look forward to when you offer online classes. Well, Mary, I knew the whole undertaking was just you. I am always amazed at how much you get done. We exchanged emails once about audio books. [Did we mention jigsaw puzzles in the same emails?] I saved your email because you recommended some great listens. You mentioned family members. I sense that between embroidery activities, you’re running loads of laundry, fixing little lunches, making phone calls, and all the things the rest of us also do. . . . I can imagine how it might have hurt that someone thought you were a committee or a faceless money-grubbing corporation. Recently I went to a place on FaceBook where there was a disagreement. Someone consoled someone else to “just consider the source!” She was talking about me! I felt terrible and then asked Who am I? Someone who started Sunday School at age 2, took piano lessons and soon found out that Middle C is NOT in the middle! Someone who loved reading and dreaded volleyball. 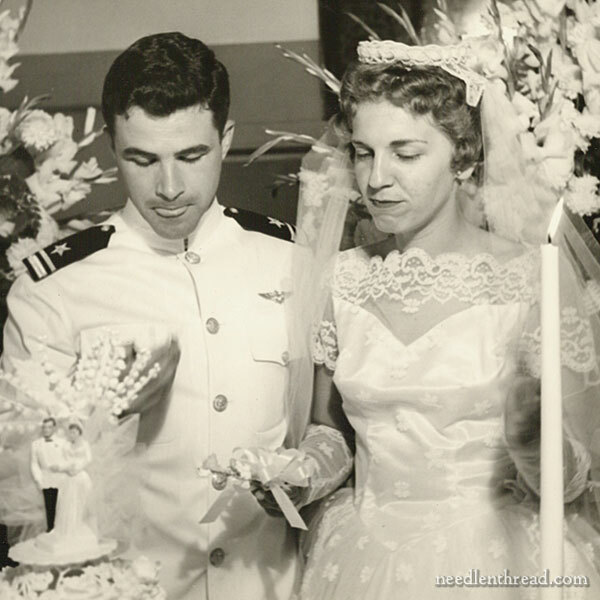 Someone who played church music, went to college, went to Europe on a student tour after waitressing for two summers, joined the Air Force, studied in Spain, sewed her own clothes, typed very fast in many offices and finally got married in a beautiful white wedding. Someone who drives carefully, is bondable and debt-free. Someone who thinks the sky, the trees, the bedding and all her clothes should be turquoise! [Bananas are pretty good frozen!] So consider the source. I unfriended 9 people and two groups that night and gained a new insight. We are all entitled to our opinions and preferences. Each of us can say “How I am is good enough!” — even as we try for perfection. In all our crafts, we reach a point where the work is good enough, as good as we can make it under the circumstances, as good as it needs to be for the purpose. What people don’t know about us is their problem — not ours. We are all works in progress, evolving wonderfully. Thanks for sharing, Mary! Wonderful post Mary. I found your website when I was looking to learn basic embroidery stitches for quilting. You’ve shown me there is so much more. Keep up the great work. By the way, I can’t stand bananas raw, cooked or baked. Thank you for sharing your story today. I loved seeing your photos. It was a special treat. I don’t comment very often but I read your email everyday and love it! Sometimes I go on a wonderful adventure by clicking on websites I didn’t know existed and seeing such interesting things you bring to our attention. I never doubted you were you! I think your website is the greatest needlework resource available today. You have put so much helpful information on your website I am amazed by it. I belong to my local Embroiderers Guild in South Australia (I’m still a beginner embroiderer!) and when I attend some of the regular stitching Group gatherings(a group each for specific stitching technique)or a Class I often here people say oh Mary Corbet has a wonderful video showing how to do that or check on Mary Corbet’s website for that information. We have the feeling you are a wonderful person and friend to us all, especially on our needlework journeys. Keep up the great work you do. Many of us don’t comment very often but we look forward to spending time with you everyday. You are very much appreciated. Thank you Mary. Mary, well I’m glad that you are just you b/c I really like reading the style you write in & what you write about! Delightful photos too! And I thank you for sharing all your talents and answering all the crazy questions and your cheery sense of humor that comes through so well on the blog. What a wonderful wedding photo of your parents! Your mum looks so beautiful and your dad so handsome in his uniform – a bit like Richard Gere! I’m not an embroider (just a bit of cross stitch here and there) but I read your blog without fail every day and enjoy it so much. I can actually feel a little inspiration starting to surge through my veins. 🙂 Look forward to getting more enjoyment from your blog! Thanks for the info – and good for you for taking the leap. It is a big decision, one I never made but I am glad you did because I totally enjoy your site. In fact I have circled around to doing more embroidery and you have been a big part of that; so thanks for all the info, you are doing a great job – all one of you. Mary, you are very real, and a wonderful teacher. Your college students’ loss is our great gain. Dear Mary thank you for doing what you are doing. Your detailed explanations of embroidery stitches are brilliant, you are always my first port of call if I am not sure on a way to make the stitch work properly. Mary, your blog is charming. One of the things I find disconcerting is perfect strangers sharing their life with me. Some things are personal and private and some are public. Maybe I’m old fashioned…. Your blog is helpful and educational. Like the lady in Joliet we don’t have anywhere to take lessons except thru our EGA guild which thankfully is a teaching guild. I learn something new everyday from reading your blog. I look forward to it everyday. Knees up the good works. Thanks so much, Mary! You’re an inspiration and I’m so glad you do what you do and you are who you are. I’m in Vermont as well – hiya, needley neighbor! I do understand that you don’t give personal data on your website. As you wrote it, it is an embroidery website. In addition, in the expression “personal data”, the word “personal” means it’s not our business ! Many thanks for all the work you’re doing to give us great time reading your postings and trying to follow your advices ! Thanks Mary that was a generous gesture but I agree with you it wasn’t necessary since you do mention bits here and there, and this is an embroidery site. We all know you’re real! My mother hates bananas, I hate bananas, my daughter hates bananas. I’m thinking that maybe it’s genetic!?! I however love your blog. What a treasure you are for creating a treasure trove of information for all of us. Thank you, thank you, a thousand times thank you!!!!! You are amazing! Truly! I think of you teaching classes at school and free embroidery classes on the side for any length of time, and I’m totally wow-ed. You have been a credibility, face, and life saver with needlenthread. After a year the girl asked if I knew how to make a French knot… and I figured I could find out how to do it correctly before next week. Enter needlenthread – we were off and running. I’ve learned SO much from your videos and writing, never expecting to get hooked on embroidery myself. Are you nodding knowingly? Yes, it’s addictive. So knowing the cost in time and dollars of doing even a tiny class of one, I’m in awe of what you’ve done and are doing. You are the Wonder Woman of thread! You have my heartfelt gratitude for sharing your expertise. Thank you Mary for your nice letter that I read avidly, in the morning, most of the time, still in my pyjama. I learned quite a bit since I started reading you, two years ago. I also joined a Guild. And right now, we are 15 people working with your Lattice jumble project. I refer to your tutorials often. And I like your sense of humour. And it is too bad you do not like bananas, but I hope you will go on loving embroidery. Love your blog, and you. After spending huge amounts of time reading many blogs, I feel that people’s personalities come through in their blogs, regardless of what they’re writing about. I hardly know anyone who has a blog, so I can’t test that theory, but you come across as someone I’d love to know as a friend. It makes the blog so much more pleasant to read. Glad you limit personal info (though this was interesting!). I’ve stopped reading some blogs because I read something that annoyed me, though I certainly understand a blogger’s right to state opinions and so on. I like your focus on the subject at hand and keeping your private life private. I must admit I unintentionally filled in the void with a fantasy of what you’re really like, and I had you married for sure. Now that I think of it, you have never mentioned a DH, but I was sure he was just in the other room, reading. Well, we are probably all the richer for your single life because husbands can be very time-consuming creatures to care for. Thus, we get more of you this way. Such a happy story; thanks for sharing. Thanks for sharing all this. Found it very interesting. Thank you for baring your all, so to speak. I confess I was not just chagrined but downright angry on your behalf when I started to read this post – how dare some unknown quantity question the integrity of our Mary, I thought. But as I kept reading I came to much the same conclusions as you had although I still think it’s a shame that you felt compelled to tell all just to satisfy the curiosity of one. You are right, the whole thing is about embroidery and you have never held back about that (except when it comes to how much you paid for some of your gorgeous pieces, which is none of our business in any case). I must be terribly naïve about blogging, it never occurred to me that a single blogger would be more than one person but I can see how it would work now. I love this blog and can’t wait to read it every day and on the odd occasion when it is something that doesn’t interest me very much I feel very disappointed – not your fault though, catering to thousands must be hair-tearing stuff at times. And like other commenters, I too gag at the thought of a banana. I don’t even like the smell and leave the room when my husband cuts one up for his breakfast. I thought I should speak out once in a while. 🙂 I have never doubted you are one real person. I also appreciate that you keep your blog about embroidery. Still, it’s nice to learn a little about the person behind the blog. Thanks for sharing. And, of course, thank you for all the embroidery information. So glad to have found you through fellow stitchers at my EGA chapter. Are you a member of any guilds? I have emailed you on your general contact but got no response,so I hope you have time to answer after reading all that you do to keep things humming along. Thanks for all your hard work and giving nature. Well, I never thought there was more than one of you, but it was interesting to hear a bit more about your personal life. I like the way a blogger can choose how much or how little to reveal about their off-topic self. Dear Mary, you brighten each day with your emails. I love your website and your commitment. Thank you for sharing your personal life with us today. Really just want to say a huge thank you! Hoping to get to know you and what you do a lot better. Congratulations. I’m 66 and just giving up ‘serious’ work, well mostly doing lots less to focus on even more fun stuff. I will still try to teach mindfullness but now thru thread crafts more and more I hope. I’m half American (lived in the US from age 12 to 21) but have been back in England since then except for teaching colour counselling in lots of different countries these 20 years. Now I plan to move to the Dingle peninsula in Ireland. Thank you again for your beautiful work, clear instructions and generosity, this is a really beautiful site to visit. Hi everyone this is a little apology, I did not realise I was talking to all of you. I guess I’m just totally new to blogs. But really pleased to have found this one. So thank you everyone. Soooo glad to have found you. I never doubted you were real you actually make mistakes – a committee would never allow you to show mistakes! However I do now realised why you can mange the blog and the embroidery No Husband! Much as I dearly love mine he can dominate, if unintentionally, my day; originally at work as we had a family business and now in our retirement. Never give up the blog it is sometime3s the only bit of “embroidery” I may get all day! Also having moved to Scotland I have left behind all my old fellow embroiderers, and it takes time to find new ones. Knowing your Blog for a long time, the idea that you are not “a real person” made me laugh ! But with this post there are no more doubts for anyone..I moved my very first steps in goldwork reading your posts any years ago so I can say YOU have been my starting point and I’m gratefull. I for one am very happy to know a bit more about you…I will tell you that you have taught me much, encouraged me lots and I look forward to visiting with you. Please continue to stay around! Hugs to you from me. Missed this post yesterday I was babysitting for my Godchild. First of all I would like to say thanks for explaining who you are and I love the photo of your parents 58 years wow wonderful. 111 of you I thought I came from a big family six siblings and eleven nieces and nephews and eleven great nieces and nephews and 1 great, great nephew and more to come as they meet perspective partners and have babies. I agree with what everybody has said about Needle n’ thread I love it. I love the How-To videos the Tips and Techniques the many many blogs which are always so useful when I want information on a particular embroidery piece. Your dedication and love of needlework comes over time and time again and you continue to inspire me to learn, learn and learn more and I always learn something new from your site and I don’t know how you find the time the enthusium and all the up-to-date info on anything related to needlework I’m always impressed. I love your sense of humour and your concern for people and not just there projects but them. I appreciate how you always show how to do something through photos and thorough description of the different stitch techniques which I so appreciate when I am stuck on a particular stitch. I always, always refer to your site when I am starting a project. For example I am currently involved in a Trish burr project and I’m stuck on a Long and Short aspect of a leaf and who do I turn to, to seek advise You and You and You again. So thanks a million I would write Thanks a Million but I don’t think you would have the space and I would probably lose count, but thanks for you dedication and your love of this craft which you have taught me is and art and I try and aspire to with your help. So thanks for sharing all your expertise and explaining step by step how to do some aspect of embroidery and for the lovely way you express yourself. I forgot to say I have all you e-books and love them all they are so descriptive and useful so please hurry with the monogram e-book which I can’t wait to purchase. That’s all? Thanks for your reply. I like to reply to your blogs because you put so much effort into letting me know different aspects of embroidery, that it doesn’t hurt for me to take a few minutes each day to comment which I enjoy. Each afternoon before I start my embroidery I have to read your post and comment then I can start my embroidery. Wow what a Dad wonderful. Thank you so much for not sharing every trivial detail of your personal life with us. I’m sure I would enjoy your company, but I read your blog to learn about embroidery. Incidentally, you are an excellent teacher of your craft. picking up old hobbies from years ago. All I can say is BRAVO! I look forward to you every day! As one of your loyal readers from the beginning, the are you real question made me laugh out loud. Been silently cheering you for years as you’ve developed your “brand” and your blog. I frequently introduce people to your website, especially at work in a needlepoint shop. Though I’m always amazed to find people who haven’t found you yet! I can both understand your response of a chuckle – how could this be a serious remark? – and your chagrin at the idea you were not real or were a committee. Your website reflects what you do but is not all – it is only reporting. You do such an incredible amount that the less organised and focused may not be able to believe that one person can do it. However anyone reading the comments on how you do it – e.g. using Illustrator and Inkscape – can’t doubt that you do it yourself. I love the professionalism of your website. Your personality shows through; the site isn’t about you but about embroidery. I’m glad of that. The personal glimpses are relevant to the subject discussed. I enjoy them as glimpses. And your writing style is very identifiable; again you are real and not a committee. I follow your site faithfully although I don’t subscribe to the newsletter since I don’t always get a chance to read day by day. You probably get some idea of the actual number of your followers through the give-aways. Your site is wonderful- definitely done by one very charming organised person who works at a rate of which any committee would be proud. I am so happy to have found the site. It has given my so much enjoyment. You don’t need to reply Mary, but I really enjoyed getting to know you more personally. So many internet websites are very impersonal, so this made you more real to all of us. I’m envious of your big happy family. I’m a little late, but its never too late to say, Thank you, Thank you..I don’t do a lot of responding to this your blog, but I do read your site each day and have learned so much about embroidery from you. I got through my first French Knot by following your tutorial video. Please continue to do what you do and “more power to you, my sister with the embroidery needle”. Great post…I started following Needle n Thread for the incredible instruction and inspiration. The fact that it’s also well written and witty didn’t hurt either! I am not interested in your personal life- it’s yours and personal. I say Bravo to you and don’t change a thing! Happy Stitching! I have been following you almost since the beginning of your Blog. I love it and have learned so much from you. I have recommended your blog to so many people (one just this week) who asked how did you find this, to which I replied I just don’t remember but I have been reading it forever. I guess it never occurred to me you were anyone but “Mary”!!! From Kansas… 😉 Oh, thank you for just a glimpse of what makes you “you”. I love your daily blog and I also miss it the days you take “off”. My coffee buddy and also wonderful instructor, inspiration, and bit of fun as well each morning. I also love that you show us the real side of you as well, not just the perfection (which there is so much of) but the problems and issues, and the thinking that goes behind each piece. I had no idea tho, about your leaving your teaching job and taking that leap of faith, I must have started following you shortly after you did that. (I have no idea how I “found” you, but lucky me that I did!!!) What a brave lady you are, here I was picturing you with a hubby who brought home the bacon and allowed you to do your dream! So, thank you so much for enlightening us, and you now are even a more awesome person than ever and your efforts are even more appreciated. 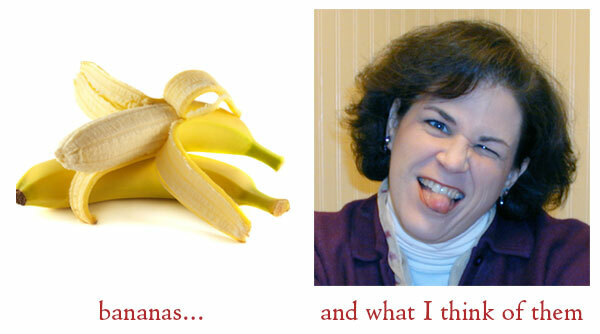 I do have to say tho, I am a banana lover, and can not imagine such a reaction to such an innocent little fruit. LOL. Have a wonderful weekend, Mary, and I send a heartfelt thank you for all you do. Mary your love of embroidery shows in each of your blog posts. That you share your passion and expertise with all your readers is more than enough! I for one am so looking forward to your Embroidered Alphabets. What a fabulous way to incorporate some lovely stitches. What a nice coincidence that the very first time I visit your site, I am treated to such a fine introduction to you as a person. Thank you for sharing. Having not done embroidery since the 70’s and 80’s, when my Mom owned a needlecraft shop, I was looking to brush up on some of the stitches, and found you through your youtube videos. You are a wonderful teacher. I don’t know why I dropped embroidery, when I kept up with so many of the other things I learned at Mom’s shop: crochet, cross-stitch, knitting, needlepoint, etc… but I’m looking forward to jumping back into it, and your site and videos help a lot. Thank you! Believe it or not, when Mom closed her shop, I made a stash for myself of lots of thread, yard, canvas, notions and other materials, and a few kits as well. I still have one of the kits, an old Elsa Williams design with a Siamese cat and a bumble bee, and I think I might warm up with that one! Thanks again. Just the other day I was wondering how you made money now that you had given up full time teaching. (I remember reading about your big decision several years ago.) It must be wonderful to be able to do your favourite thing for a living, but I imagine that having to come up with new content every day must also be challenging. Oh I’ve never doubted that you are you and not a multitude of people. I am at times amazed at all that you accomplish! You put such incredible energy into all this and I’m so happy I came across your blog. I’m looking forward to all you have to offer, there’s so much to learn, and your site is a feast for the eyes. All I can say is THANK YOU! I apologize for the late reply – I’ve been busy insulating my garage door. I love your articles for their information and the personality you let shine through! I have Nordic Needle on my favorites bar and go to the site from there. If, however, I access the site from your link, do you get credit for my visit? Do you only get compensation from them only if I make a purchase? Hi, RJ – no, no compensation if you click through on my site, so having it in your favorites is just fine! Thanks for asking, though! Dear Mary, Even though you don’t put all sorts of personal stuff in your posts, it’s easy enough to see that you are a real person if you READ the posts on a regular basis. Sheesh. I’m beginning to think that reading and interpreting are a lost art too. Anyway, I enjoy your blog and am very glad that you are able to post every day. Thank you. Mary, I have to say you have made my day! I so enjoy your blog,the first I check each day. I am sitting here in the hospital waiting while my husband is having his 16th surgery and have just now had a chance to look at Needle’n Thread. Your family reminds me so very much of my own for I have 6 brothers and 2 sisters and we are all very close. Your embroidery work is beautiful and I am trying to learn as much as I can. After doing Hardanger for years I find that I am being drawn to surface embroidery and am still trying to find my way. Thanks so much for all the lovely work that you share. Dear Mary: Good for you the blog of the many Mary’s you are thought to be by some people. I just want to say Thank you Very Very much for your blog and website that I look forward to seeing everyday. It is encouraging, helpful and educational and I have enjoyed following “your” projects and learning from all the things that happen on Needle n Thread. Mary, you’re the cat’s meow! I decided that our family is to have embroidered velvet Christmas stockings this year, and I set out to learn embroidery, and your site has been a fount of information. Thank you! Congratulations on the success of Needle ‘N Thread. It’s obvious that you’ve put your heart into it. Thank you for this small personal insight. You’re right, we don’t need to know anything personal about you but this little resume is great. I’ve never doubted that you are one person because of the way you write. Your photos and videos are a fantastic resource and I’ve always been shocked about the fact that it’s all available free. Many others would make it available by subscription. Another regular email newsletter I’ve been receiving and usually offers and promotes goods and retreats at (for me) fairly high prices have now come up with the idea of offering their service on a monthly subscription. The Royal School of Needlework (which is comparatively local for me) simply said that they know of your work and website. THEY don’t offer free how-to videos and pictures of the excellent quality that you offer. I’m sure they’re afraid that they’d lose out on their attendance at courses they offer, but I seriously doubt it. In fact, it was when I was at one of those courses that someone suggested I look at your website and I’ve been hooked since ;-). I don’t know why I do go on their short courses when you have such valuable material available on your website, but it’s nice to have that personal touch. You might like to consider making this a subscription only information base. Even a small one would probably make you comfortably able to afford your regular outgoings. I’ve made a point of buying everything that you have on offer for sale as I had not occurred to me that your sponsors are a way for you to also gain an income from what you do. Suppose you simply asked for $5 a month? or $25 a year? I even had one place that offered an service for an annual subscription of $3.99. A different service I enjoy with regular up-to-date information charges £10.75 or $16.13 per month. So you could make it easily affordable. Do you have any idea how many people enjoy your regular blog newsletters? I bet Thousands, how much would just $5 from each of those do for you? Is there a charity you favor that you might be able to help if you don’t need that much money? Consider making it a business that way. Loved the answer to “who are you?” I have one question, how the heck old are you? If that’s any where near this years photo on your site you are a very young looking lovely lady. To have done all you have done should have taken you a lot longer than you look. I read your site all the time, love it. Sorry if it’s a “too personal” of a question, but your photo amazed me. I had to ask. well, I can’t say 29, can I? That particular picture is quite a few years old… I’m 45. Interesting that someone thought you were multiple people! Your editorial voice is distinctive and consistent, so I find that a puzzling claim. Dear Mary, I e – mailed you from my site and the e – mail came back to me, saying in two words that there is something wrong with your server. This was told to me by Google. I’m writing you from your site. That way I know it’s getting to you.Please let me know if, anyone else is having a problem?, or is it just me? I’ll be waiting to hear from you. Sincerely Yours, Louann Cermak P.S. If you run into problems please e – mail my husband. Hi, Louann – my email seems to be working fine. I wonder if it is not the email address you are using to send from? It is listed here with a “www.” in front of it, which is not the normal format for an email address. Ps..I totally understand your aversion to eating a banana right out of the skin! J’ai pris le temps de lire cet article en entier, et j’ai adoré ton expression : mon blog a grandi comme une mauvaise herbe dans un climat ensoleillé mouillé ! Moi qui ai un tout petit blog j’imagine bien tout le temps que tu dois passer à faire vivre le tien ! Et même si tous les articles ne m’intéressent pas, je les lis tous grâce à la traduction en ligne, mon anglais n’étant guère efficace. J’apprends beaucoup de choses grâce à toi, et les techniques abordées étant si nombreuses, il y a toujours un petit quelque chose qui me concerne ! ce qui fait que je te lis avec plaisir… et je suis d’accord avec toi en ce qui concerne ta vie privée, elle doit le rester. Les réseaux sociaux sont faits pour cela et pour ceux que ça intéresse, ce qui n’est pas mon cas. Donc, longue vie à ton entreprise, surtout ne change rien ! I am so glad I stumbled upon your wonderful site. I have learned so much since I first fell into your nest of know.edge, history, technique, humor, and enthusiasm. It has not even been a year yet, but I have grown as a needle woman and am much more confident because of YOU! Thank you! Earlier in 2014 you shared information on a book that talked about sailors using torn and tattered sales to stitch needle books and various items. I wrote down the name of the author and title of the book but have misplaced the information. Would you beso kind as to help me with this information? Thank you so much. I will preface this by saying I have never done anything like this before ..and am in fear of being alive in cyberspace..big brother stuff..but..
wow. I wasnt expecting your frankness, nor did I feel I had a right to know…but thank you. I have recently jumped in to rediscovering my love of hand sewing. Over the years I have always sewn, but the hand embroidery takes me back to the precious times I had with my Mum, who taught me to sew. Never, never shall I reach the level of expertise she had, but gee I am having fun trying. This is my time for me..no more am I restricted to sewing for home and family (still do it thought:)) but I can now make things for ME..because I love them or want to learn how to do them. I joined a sewing/embroidery group and have learned so many wonderful tips and techniques. The added benefit is that I made some new friends and I can say that the quilting, sewing and embroidery people are a very generous species..unlike other groups. Rather than continue to rave on..may I say that one thing we share is our comment and reference to you..our lessons learned, our admiration for the simplicity of the demonstrations you provide, and the variety of stitchery you cover. THANK YOU. You say you live in a bit of an isolated are..so do I . I have to travel to everything..but gee it is worth it. Final thing. I would love to have a coffee with you..love to see your work room..even get out of my subtropics and walk in the snow! That is how you make me feel via your neddlenthread.I think there are thousands like me that (almost) feel the reason we don’t pop in to say hello is purely dictated by distance…and the numbers of cups in your dresser! Now draw breath…I am not packing my bags or anything so presumptious….I just wanted to illustrate how much I enjoy your friendly style while learning so much. I hope you continue to thrive and keep doing what you are doing…it is very much appreciated. Your talents as a teacher are self evident, but thanks for sharing some of your life story with us. Hi! I am SO happy you decided to make this post! I am extremely new to needlework and right now I am only doing counted cross stitch, but I long for the ability and technical skill that you have for fine embroidery! I have been basically binging on your website trying to get all the knowledge I can before jumping into it! Also, have you thought about maybe making a Patreon account? I know that I would absolutely pay per post for your amazing work! Just a thought! Oh, a first time project. Have you thought about just working a spot sampler and testing out a variety of stitches? What type of surface embroidery do you want to do? Did you see a particular type that grabbed your attention? Or are you just trying to learn the ropes in general, before focusing on any particular type? There are many, many types of surface embroidery, so I think a starter project would depend on what you really want to create. Otherwise, if you have a particular technique in mind and you’re looking for a beginner project in that technique, let me know, and I’ll think about it. I’ve heard of Patreon, but I’m a little…well, hesitant to use that kind of thing (primarily because I can’t see too many people actually participating! ), but I’ll think about it some more. It would have to be kind of an “extension” of Needle ‘n Thread – extra stuff that I don’t do on the website…and that becomes problematic just because of the time involved! But, I’ll keep it on the back burner and stew over it a bit! Gosh, has it been 4 years already? There’s nothing like being in at my local Embroidery Guild and having someone say “have you read Mary Corbet’s blog today?”. Your blog (you) are a thread (bad pun) that holds our community together. I’m a newbie – about a year – to your website. Every time your name and website pops up in my email I RUSH to push the ‘open sesame’ button! After a half century of my doing surface embroidery, you always bring renewed embroidery joy and knowledge. Thanks for your personal sharing. I do appreciate your struggles in making important life decisions, and in keeping embroidery at the forefront of those decisionns. You have soooo much to give to soooo many!! I really enjoy what you do and I thank you for all the pleasure you give me – even if there is only one of you! Take care and I will let you know how I go with an order that I am trying to make with French Needle which I visited for the first time after you drew my attention to it. Thank you for all the information on needle arts. This is the best, most comprehensive site that kept popping up over and over when I decided I wanted to improve my skills, and take up this technique that I have not done for 30 years. I don’t know why I was surprised that you are located in Kansas, too! Why not! I live in Greensburg and we have a wonderful stitching shop, owned and operated by Starla McClain. Next Next post: Crewel Intentions x 2 & Beginner Blackwork & Thanks!